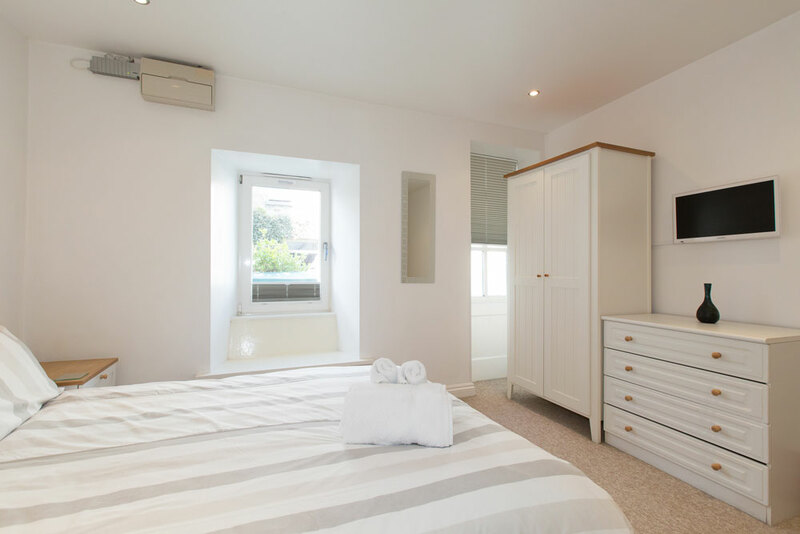 Rock Cottage is a luxurious and spacious ground floor apartment in the finest location in St Ives in terms of proximity to all the town can offer. Situated opposite the Pedn Olva Hotel (the large white building on the rocks in the centre foreground of the photo above) in The Warren, the quaint narrow street which links the Porthminster Beach and Harbour areas, you simply cannot be better placed for quick and easy access to the beach, town centre, harbour, restaurants, shops and transport links. 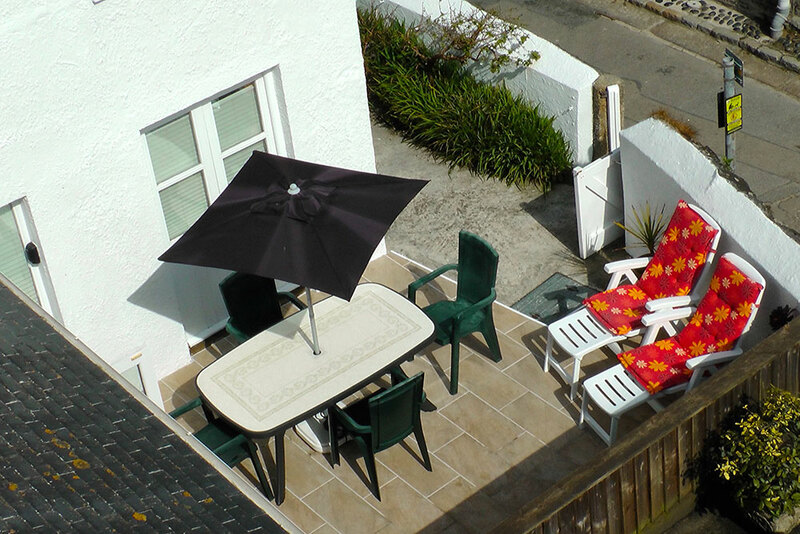 The acclaimed Porthminster Beach Café is a gentle five-minute stroll away. 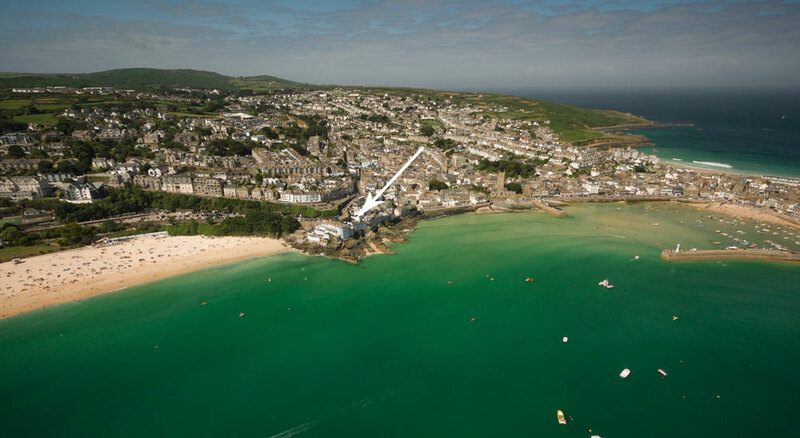 Parking in St Ives is invaluable, so we are delighted to be able to include a reserved, numbered space on the Railway Station car park less than 200 yards away. 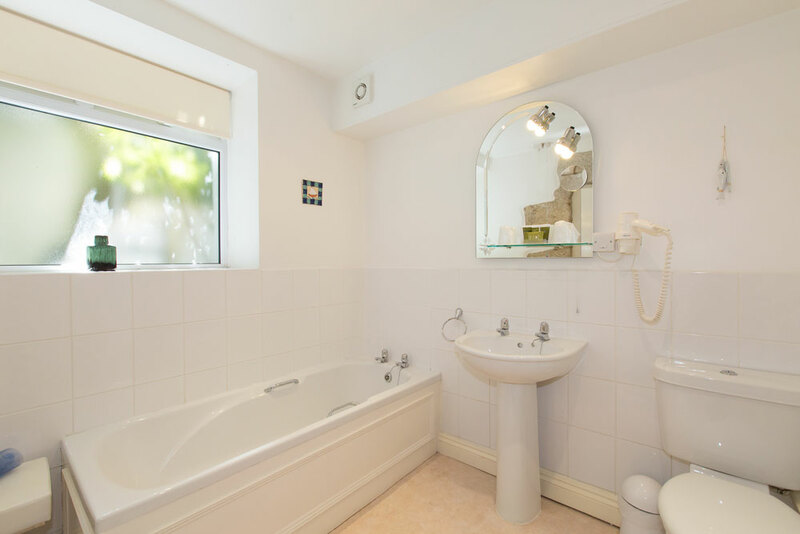 The location is also perfect for the bus and train stations, which are both under 200 yards from the property, as is the town centre. 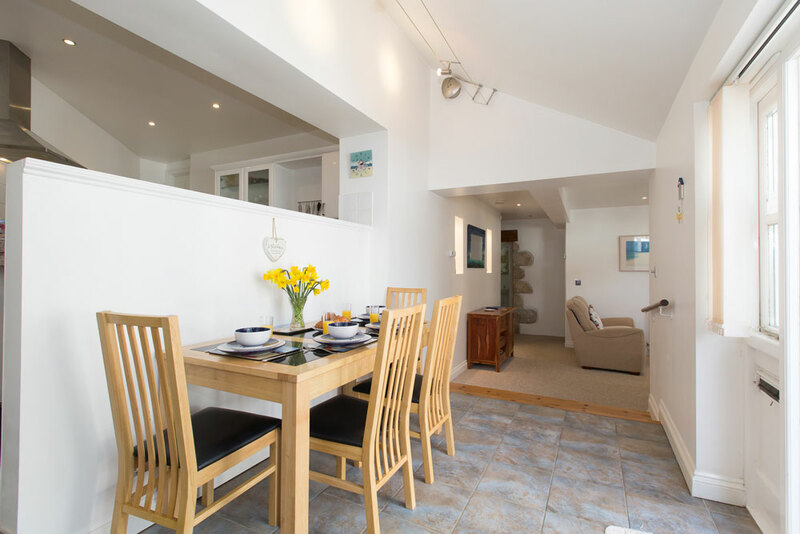 A flight of steps 50 yards from Rock Cottage takes you down to Porthminster Beach (depending on the tide), otherwise the slope down to the middle beach access point is just 200 yards level walk away. 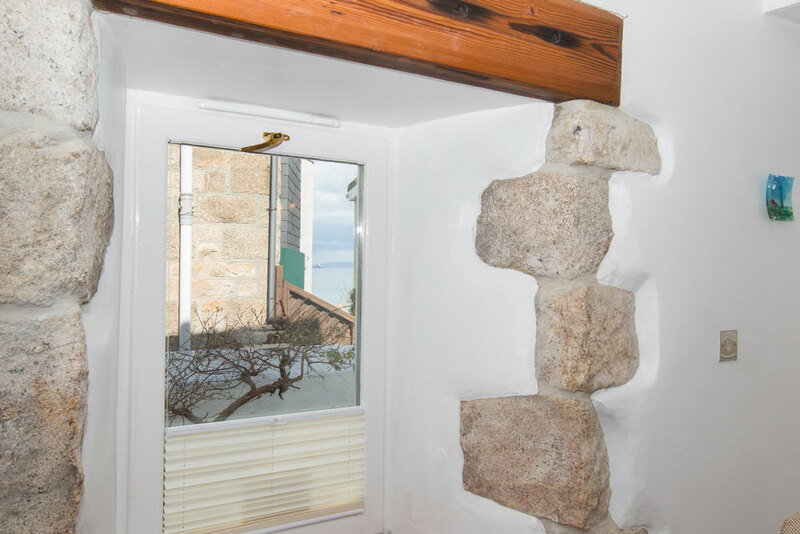 This former tin miners’ cottage, refurbished to the highest modern standards with Jo Downs’ handmade fused glasswork giving a contemporary feel, retains the character of its original incarnation by way of the revealed granite quoins in the lounge and bathroom entrance, and restored railway sleepers as decorative architectural features. 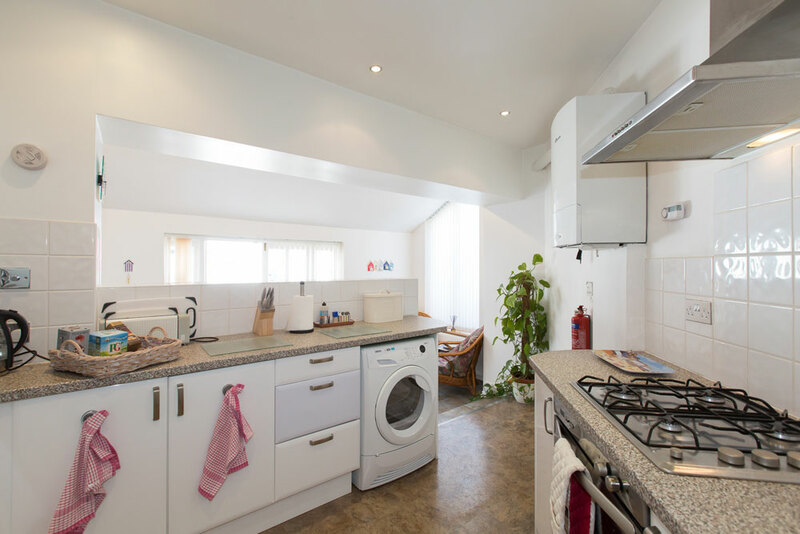 Rock Cottage has a large open plan lounge/dining area, modern fully-fitted kitchen with gas oven, grill, Tassimo coffee maker for that morning cappuccino, fridge/freezer, dishwasher, washing machine (powder and tablets provided) and tumble dryer. 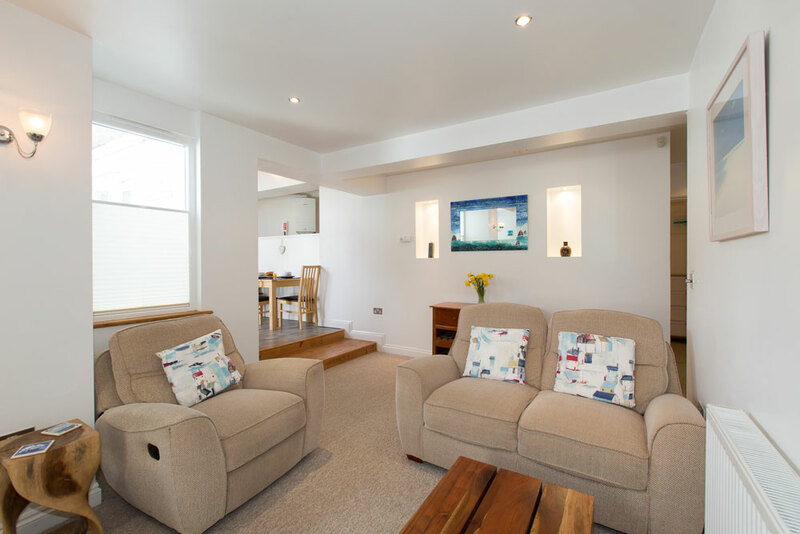 The lounge has two comfortable armchairs, a sofa and a TV/DVD player. Wi-Fi is always available. From the lounge window and patio gate there is a slight seaview towards Godrevy Lighthouse. The internal dining area is next to a patio garden with quality outdoor furniture, including reclining chairs, – ideal for morning coffee and anytime alfresco dining. Entry to the property is up 2 steps (from the street) onto the sunny patio area. Once inside, the lounge, bedrooms and bathroom are all at ground floor level. 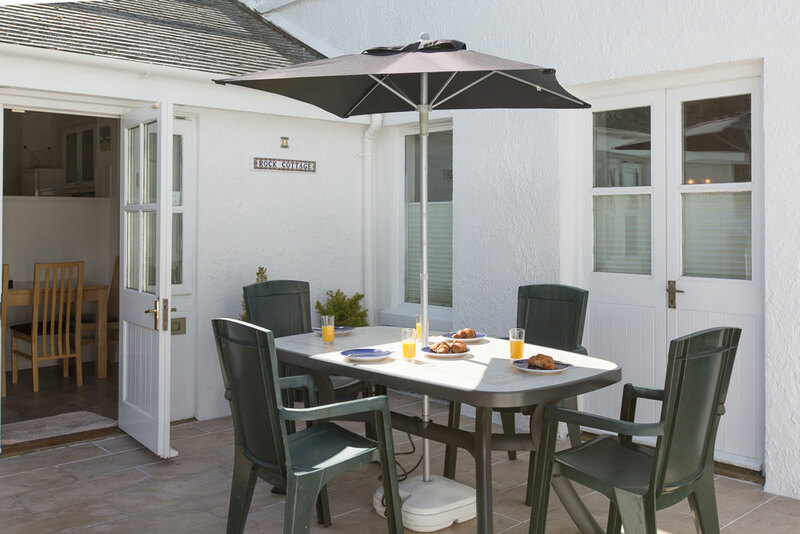 There are just 2 steps up to the dining area, and 2 more into the kitchen, making Rock Cottage particularly suitable for those with mobility issues. 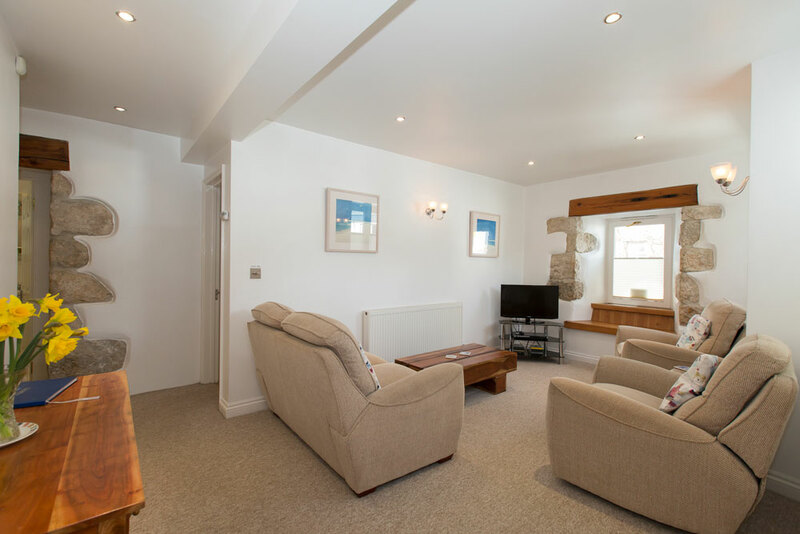 Rock Cottage is double-glazed and fully centrally heated. 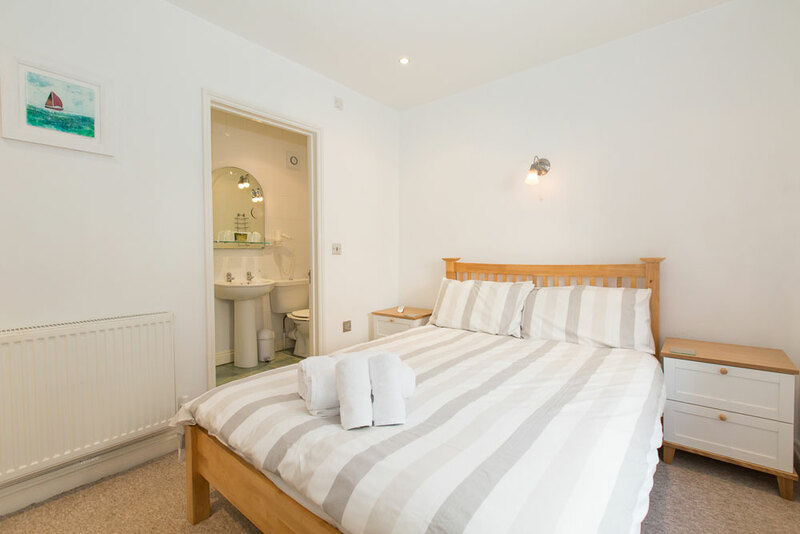 The beds have luxurious hand-crafted Hypnos mattresses with all linen and towels provided, along with quality Basic Earth Botanicals environmentally-friendly toiletries and a small welcome pack. 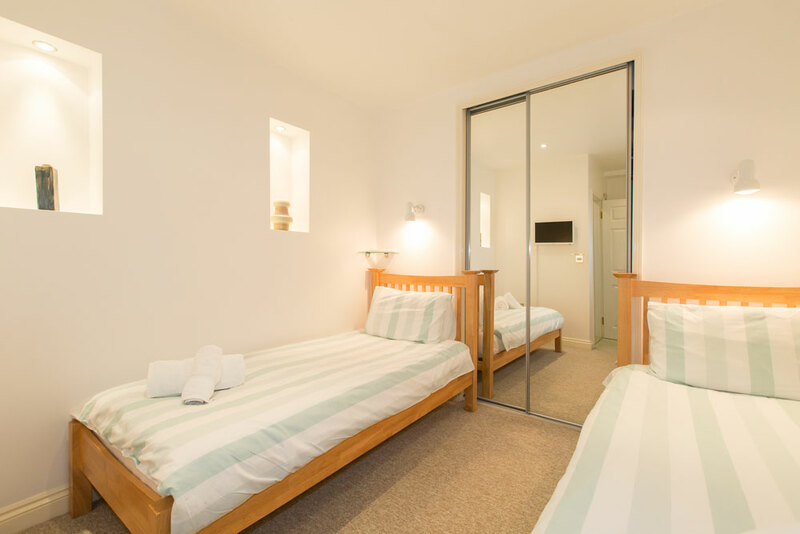 On The Warren side, the double-bedded room has a large wardrobe, bedside tables, chest of drawers, digital TV and en suite shower and toilet, with wall-mounted hairdryer. 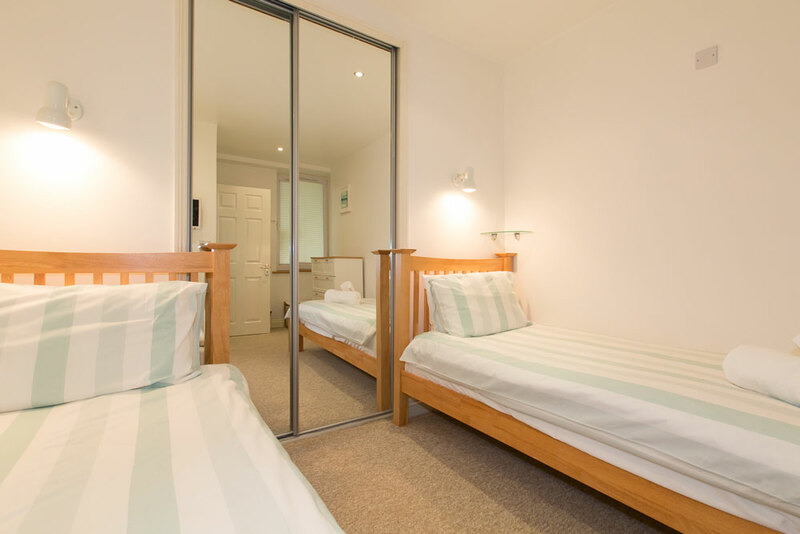 Situated off the lounge, the twin-bedded room has a large built-in mirror wardrobe, chest of drawers, reading lights over each bed and digital TV. 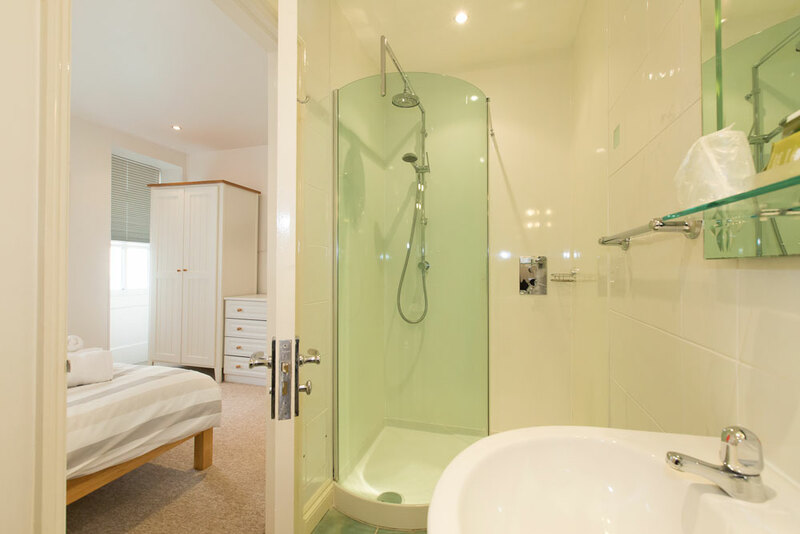 There is a full-size bathroom, with bath, basin, toilet and wall-mounted hairdryer immediately next to this bedroom. For the latest updates on Rock Cottage (and St Ives) ‘like’ and follow us on Facebook via the icon at the top right of this page. Pets and smoking are not permitted at Rock Cottage under any circumstances (although of course you are welcome to smoke outside the property in the patio garden).